The refugees, largely from Syria and Afghanistan and attempting to travel through Europe to seek asylum, left a deteriorating camp at Idomeni, Greece, walked several miles and attempted to cross the Axios River separating the two countries[?!!?]. They left in a long line, carrying their possessions as the procession snaked along a hilly road, and followed a rope installed across the river to FYROM [*]. About 1,000 traveled together early Monday, followed later by a group of about 500 more. 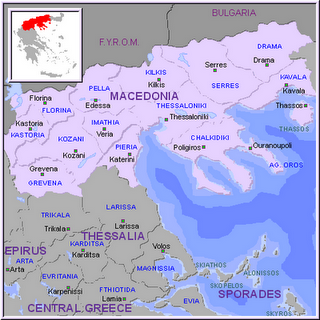 Although FYROM [*] has secured its border with miles of barbed wire, the river is a regarded as a natural barrier meant to keep people from crossing. 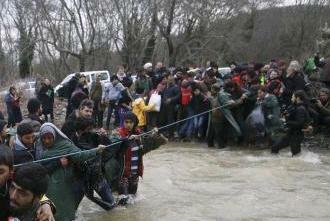 Hours before the outflow of refugees, three Afghan migrants drowned while attempting to cross the river. FYROM [*] intelligence sources said police and the army "intervened" to collect those who entered the country, adding the migrants will be returned to Greece. It was unclear how many were detained by FYROM [*] officials, and where they will be taken. About 12,000 people remain at the sprawling Idomeni camp. 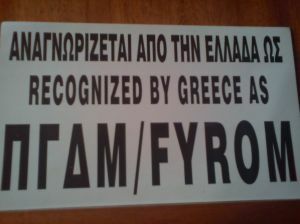 ***Ethnologia uses the recognized name FYROM. By using Ethnologia, you agree to the U.N. Charter in this issue.